We drove into Greensburg, scanning the landscape, attempting to understand the magnitude of what happened to this community when it was hit by an EF5 tornado in 2007. You can still feel some of the devastation today, especially in the few large trees that are left standing, stripped of bark and small branches. Our Greensburg guide, Stacy, met us at the Kiowa County Commons Center, one of the newly built structures on Main Street, an area leveled by the tornado. Walking down Main toward the shiny, new water tower, we got a glimpse of some the exciting, alternative building methods being used in new construction. One block over from Main, we toured the 5.4.7 Art Center, a beautiful glass-clad and recycled-wood building where we admired a display of black-and-white portraits embedded with Braille messages. In the basement, we saw the rest of the portrait collection as well as the battery cells that store the energy that three small turbines are generating outside. After a few more photos in front of the Arts Center we were on the road again. 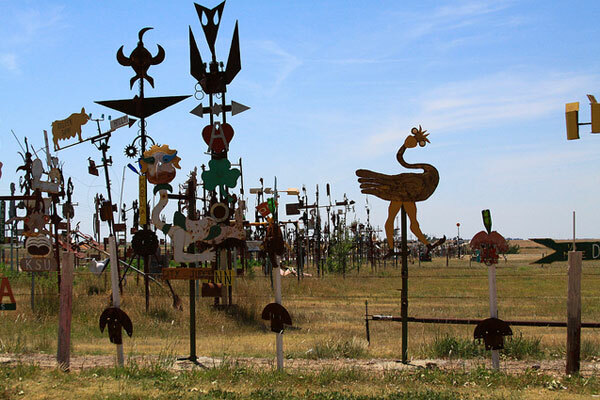 On the west side of Mullinville, we were surprised by roadside metal artwork by M.T. Liggett. We had to pull over and get pics. After our stop, we noticed a little shed down the way and – after a friendly wave from the shed’s white-haired occupant – we decided to visit. There, Mr. Liggett himself showed us his coffee-mug collection, which he reports totals nearly 26,000 pieces. As you look around the building, you realize there are coffee mugs EVERYWHERE – along with eyeglasses and various scrap-metal parts and pieces lining the place from top to bottom, wall to wall. An interesting Kansas character. From Mullinville, we moved on down the road to Montezuma, home to the Stauth Memorial Museum. I had heard the museum was something to see and it really was. It’s amazing to learn about the world travels that Claude and Donalda Stauth enjoyed in their lifetime. About 90 percent of the items they brought back from their adventures are on display in the museum’s permanent collection. In the rotating exhibits gallery, we enjoyed looking over displays of local artists’ works. I’m glad we pushed to get there before the museum closed. Saturday morning, we drove from Dodge City to historic Fort Larned. 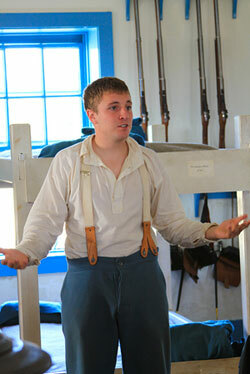 At the museum and visitor’s center, we first watched a 10-minute video on the fort’s history. Then, we were on to a tour of the barracks, where our guide, dressed in period costume as a soldier, explained how objects around the room and the quarters were used. Barracks are lined with bunks that appear to be a little wider than a modern twin bed to accommodate two soldiers sleeping head to toe. That’s close quarters! Our soldier friend guided us through other fort buildings: the blacksmith’s shop, commissary, hospital and even an underground space for solitary confinement. We left the fort with a whole new respect and understanding of what Fort Larned soldiers and Santa Fe Trail pioneers accomplished. Next, we traveled through Larned to Great Bend where we enjoyed lunch at Treader’s and stopped at the zoo where they have a state-of-the-art raptor rehabilitation center. We then headed for the Cheyenne Bottoms Wildlife Area and the Kansas Wetlands Education Center. The Center offers vivid displays explaining the wetlands and their importance to migrating North American birds. They have a classroom full of small, live creatures – including snakes, salamanders, turtles and more – which I think was everyone’s favorite. Outdoors on the wetlands, we got to see red-winged black birds, but not many other species. Our host explained that the end of July is when you start to see more activity, so we were a little too early. Overall, the whole group found something to their delight on this trip. I was pleasantly surprised by so many things. Not really knowing what to expect, because I hadn’t been to most of these places before, really made our trip that much more intriguing. It is so easy to overlook what’s right in your own backyard! Jennifer Haugh, who is Tourism Communications Manager for the State of Kansas, and Editor of KANSAS! magazine.